Monogram Weekender Bag. 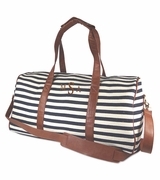 When summer calls for a practical weekend bag for seaside trips, beach vacations and warm weather travel this fun duffle fits the part. Fashionable Gecko pattern in teal, lime and indigo blues. Quality constructed micro fiber with front zip pocket and dual side to side zipper opening for easy access to contents. Hand carry, or use the over the shoulder strap, reinforced bottom. Add your person monogram or name for a classic look. 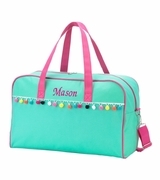 The personalized weekender tote featuring a lizard pattern measures 21�W x 14�H x 10.5� across the bottom. Zipper closure. Reinforced bottom with rubber feet.